Samuel Rosenwald, B.Sc, D.Ch. is a chiropodist specializing in laser toenail fungus in the Toronto, Ontario area. When you choose the North York Foot Care Clinic, you are choosing a respected, experienced, and compassionate chiropodist in Toronto. The North York Foot Care Clinic specializes in the diagnosis, treatment and preventative care of all types of foot problems. Keeping you active and on your feet- that’s our first priority, and we’re confident you’ll find an unmatched quality of care. North York Foot Care Clinic is here to help identify the source of your pain, listen to your symptoms, and recommend an individualized treatment plan for the best possible outcome. We do this by utilizing the latest treatment techniques, cutting edge technology and a compassionate, gentle approach to patient care. 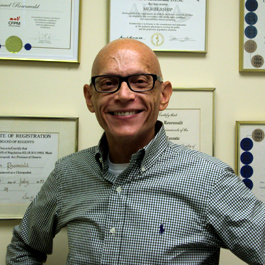 As you navigate the sites pages you will find valuable information about our practice, including hours of operation, chiropodist bios, contact details, and directions to both of our North York and Etobicoke offices. Make it your priority to take care of your feet. Start today by teaming with an expert in foot care, a chiropodist in Toronto that listens to your concerns and helps you return to a pain free active life.